Cherry Blossoms, indeed! The fragrant aroma of cherries, cinnamon and bread baking is a prelude to these delicious sweet rolls. In a small mixing bowl, combine powdered sugar and milk; mix well. Pour mixture into a 9-inch deep-dish pie pan. 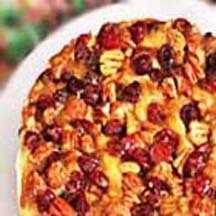 Sprinkle 1/2 cup of the cherries and pecans evenly over sugar mixture. On a lightly floured surface, roll bread dough into a 12 x 8-inch rectangle; brush with melted butter. In a small mixing bowl, combine brown sugar and cinnamon; sprinkle over dough. Top with remaining 1/2 cup cherries. Roll up rectangle, jelly roll style, starting from a long side; pinch to seal edges. With a sharp knife, cut roll into 12 slices. Bake, uncovered, in a preheated 375°F (190°C) oven 20 to 25 minutes for unchilled rolls and 25 to 30 minutes for chilled rolls, or until golden brown. If necessary, cover rolls with foil the last 10 minutes to prevent overbrowning. Let cool in pan 1 to 2 minutes. Invert onto a serving platter. Serve warm. Recipe and photograph provided courtesy of the Cherry Marketing Institute.